NEWARK, N.J. - Sept. 6, 2018 - PRLog -- As more and more companies expand their Supplier Diversity Programs to be more inclusive of women, minority and LGBTQ business owners, entrepreneurs are finding it necessary to learn how to effectively position their businesses to take advantage of these opportunities. 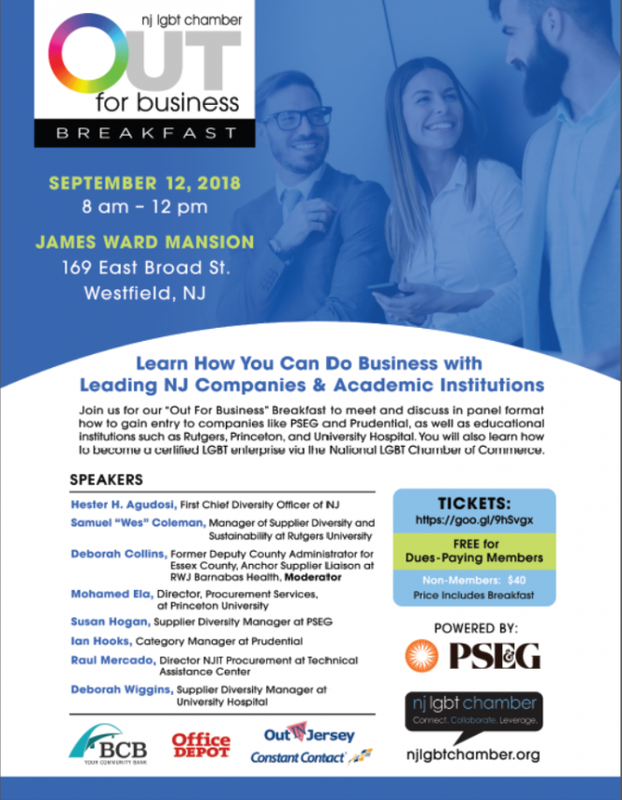 On September 12, 2018 at the James Ward Mansion in Westfield, The New Jersey LGBT Chamber of Commerce will partner with PSEG to present their "Out For Business" Breakfast, providing an unparalleled networking opportunity plus a panel of experts focused on supplier management and procurement from state and county government and premier New Jersey institutions. "We are excited to produce this very important and timely event for the New Jersey LGBTQ business community," organization co-founder and immediate past president, Tamara Fleming, says for The NJ LGBT Chamber of Commerce. "Membership in our organization has rewards specifically designed to promote and elevate business success. Events like this networking breakfast are open to all entrepreneurs and free for members of the chamber. Our goal is to help leverage B2B partnership and procurement opportunities." Attendees will hear directly from a panel of experts on how to become a preferred vendor, partner or supplier to institutions such as New Jersey's own PSEG, Prudential, Rutgers and Princeton University. In addition to the networking and panel discussion, attendees will also learn how to become a nationally certified LGBT enterprise. Current NJ LGBT Chamber president, Laurie Seliger, observes, "Becoming a certified LGBT business enterprise through the National LGBT Chamber of Commerce is a crucial tool needed to enter supplier diversity programs." The NJ LGBT Chamber of Commerce "Out For Business" Breakfast event is sponsored by PSEG along with support from NJ LGBT Chamber founding sponsor BCB and additional partnership with Office Depot, Out In Jersey Magazine and Constant Contact. The networking breakfast and panel discussion on September 12, 2018 runs from 8am to 12pm and will be held at the James Ward Mansion at 169 East Broad Street, Westfield, NJ. This event is free for current Chamber Members and $40 for non-members. The New Jersey LGBT Chamber of Commerce is the premier LGBT business organization dedicated to strengthening LGBT businesses in the New Jersey tri-state area. More information about the NJ LGBT Chamber of Commerce can be found online at NJLGBTChamber.org.